The $1,000 price point opens up fabulous choices for great value gaming laptops and a serious gamer who wants a 15-inch mobile gaming solution to back up his or her desktop gaming PC should not miss the Lenovo IdeaPad Y510p. Coming hot on the heels of its highly successfully Y500 predecessor , this Lenovo model upgrade for 2013 at $1,089 defines what a formidable, if not the best, gaming laptop can be this price point. You can buy it here. Under the hood is a 4th generation Haswell Intel Core i7 4700MQ clocked at 2.4 GHz and supported by an 8GB DDR3 system RAM upgradable to 16 GB on two SODIMM slots. Its 15.6-inch LED backlit screen is typical most laptops but his one sports the highest HD resolution at 1920 x 1080. Powering this screen is a Class 1 dual NVidia GeForce GT 750M on SLI mode with 2GB dedicated video RAM for each card. This is the 5th fastest NVidia graphics engine (single or dual) in the Class 1 category overall and for the most part, account for why this laptop just might eclipse its predecessor as a darling among serious mobile gamers. Other hardware specs include a 1TB SATA drive running at 5400 RPM, and a range of data connectivity options that include a couple of USB 3.0 ports, a single USB 2.0 port, a VGA port to connect to an external or to a high definition TV set using its HDMI port. It also comes with industry standard multimedia ports for a microphone and headphones jacks. For those using digital cameras and other portable devices using detachable memory cards, it has a 6-in-1 media card reader. It also has a 720p HD webcam, and a set of stereo JBL speakers driven by the Dolby Home Theater v4.0 system. All these features are housed in a 1.4-inch profile laptop weighing just 6.4 lbs. It comes bundled with the Windows 8 OS. Under the hood, the Y510p is powered by a 4th generation Haswell Intel Core i7-4700MQ. This quad core CPU is clocked at 2.4GHz that can be boosted to 3.4 GHz. It actually shares the same clockspeed as the earlier 3rd generation i7-3630QM powering the older Y510. In addition, both processors share the same the L3 cache of 6MB and the 22nm manufacturing process. There is just one significant downside to the Y510p implementation of the Haswell COU. While the Haswell Intel Core i7-4700MQ processor technical supports TurboBoost, Lenovo appears to have disabled this feature and consequently, the Y510p suffers in comparison with other laptops powered by the same Haswell i7-4700MQ processor. 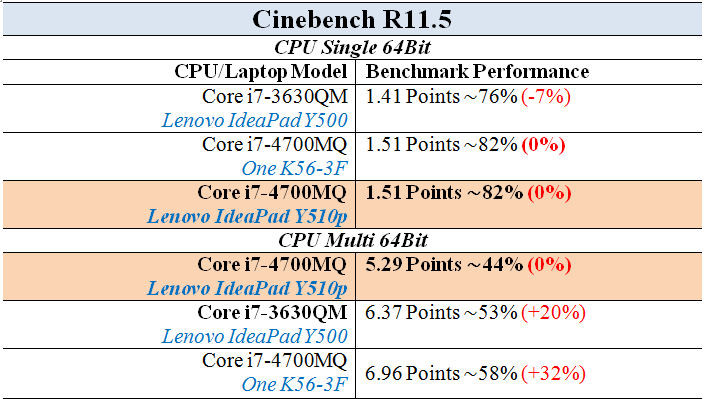 On a multiple 64-0bit test, the IdeaPad Y510p measured 5.29 points on our benchmark Cinebench R11.5 test whereas the older Y500 with the 3rd generation i7-3630QM outperformed the Y510p by 20% with a score of 6.37 points. On the other hand, on a single 64-bit operation benchmark test, the new IdeaPad does no suffer as much and the IdeaPad Y510p was measured to be 7% faster than its predecessor. The test results are shown in Table 1 below. Among the major performance enhancements offered by the Haswell architecture is its in-built graphics engine, the HD Graphics 4600 which provided a performance boost over the older Ivy Bridge HD Graphics 4000. Unfortunately, Lenovo opted not to use the Nvidia Optimus graphics switching technology to lessen the processing overhead in using a dual-GPU setting for its separate graphics card. This could have been a battery life saving feature when using non-demanding applications such as simple word processing application or when idle. The IdeaPad Y510p configures two middle-of-the-road Class One GPUs from the GeForce 700 family. These graphics cards are based on the Kepler architecture which remains the dominant high performance workhorse GPUs in many gaming workstations. This IdeaPad specimen configured a significantly higher clock speed on the graphics engine, enabling it to outperform the GeForce GT 650M (SLI) by a considerable margin. The video RAM has not changed. You still get the same 384 shader units and a 2GB GDDR5-VRAM on each card addressed via a 128-bit bus, but the memory bandwidth gets boosted from 64GB/sec to 80 GB/sec. The next more muscled graphics engine is the Nvidia GeForce GTX 760M which boasts of twice as many shader units. The GeForce GT 650M (SLI) graphics engine provides better gaming performance than its predecessor with higher clock speeds at 790 MHz for the core and 2GHz for the memory bus. On the other hand the GT 770M offers a single card graphics engine with a slightly higher 4% performance boost overall while the next SLI configured using a more muscled Class One GeForce GTX 765M GPU in SLI mode provides a significant 35% improvement. The comparative benchmarks are shown in Table 2. Our benchmark tests show that the GeForce GT 750M in dual SLI configuration offers about the same gaming muscle as that exhibited by a single GPU from GeForce GTX 770M. It performs halfway between the dual-GPU settings of the GTX 765M SLI (+36%) and GT 650M SLI (-22%). A single GTX 765M is slower by 20%. Admittedly SLI settings generally show some frame stuttering for some titles while some of the sophisticated game titles play more smoothly with the single GPU solutions. Click here to buy this laptop. You will get some good deals. Less demanding titles such as Counter Strike: Global Offensive, FIFA 13, and Dishonored easily play smoothly at high frame rates regardless of the game settings. However, resource-hugging games like Dirt Showdown, Metro: Last Light, Crysis 3, and Sleeping Dogs will require a lower game setting to play smoothly. In some cases, the earlier Lenovo IdeaPad Y500 ends up playing some titles faster such as Assassin’s Creed III and F1 2012 with medium-to-high game detail settings. Nevertheless, the GeForce GT 750M SLI compares favorably against former top models GeForce GTX 680M and Radeon HD 7970M when playing highly demanding or resource-intensive games. Company of Heroes considered the most demanding, remains problematic and can only be played at its lowest game setting which can still suffer some stuttering at a less than ideal 27 fps even when played at low and medium game setting. Table 3 below should convince skeptics about the high gaming performance of the IdeaPad Y510p. You won’t see a lot of greens to indicate that nearly all the demanding game titles released in the last 36 months can play smoothly on this laptop at high game setings. If there’s one thing to admire about the brand, it is the positive response of its makers to criticism heaped on the previous Lenovo Y500. Rather than perpetuate a glossy and reflective screen, the new Y510p now sports a non-glare matte display. It features the same high definition resolution of 1920×1080 pixels with the same 16:9 widescreen aspect ratio. While the Lenovo Y510p is advertised as having a solid state drive (SSD ), it is not user accessible. With a token capacity of 24 GB, LITEONIT LSS-24L6G SSD servers only as an ExpressCache common to hybrid hard drives whose SSD partition is not accessible directly. That means you can’t load the OS or any application on it to take advantage of its fast read-write abilities. The OS is executed from the 1TB hard drive and consequently, the overall performance is no less different from laptops with conventional HDD. Having said this, the ExpressCache does it job and the laptop boots quickly . The Lenovo IdeaPad Y510p is equipped with the Samsung Spinpoint M8 HN-M101MBB HDD performs admirably but does not really stand out. Our benchmark tests on the CrystalDisk Mark measured 88mbps data transfer rates for sequential read and 80mbps for sequential write with an average access or seek time of 17.1 milliseconds. This is typical considering it’s just a 5400 RPM HDD, so you should not expect it to behave as fast as a 7200 RPM drive. You could , however, upgrade it to one easily. The advantage of the drive is that it is less noisy than those used by several competing laptops. The Haswell i7-4700MQ features a Thermal Design Power (TDP) of 47 Watts and Haswell-powered laptops boast of better power efficiency than similar laptops using the preceding 3rd generation Ivy-architecture Intel CPUs. However, this advantage can easily be wiped out when the CPU is asked to do more powerful tasks. Indeed, compared to the earlier Lenovo Y500 powered by 3rd generation quad core, the IdeaPad Y510p tasks the Haswell CPU with incrementally more demanding hardware components so that it consumes more power. Ensuring maximum graphics performance, Lenovo equipped the IdeaPad Y510p with two GT 750M GPU’s in SLI setup. This gives the IdeaPad Y510p the advantage of speed at its price but also burdens the unit with a higher power draw. This power consumption was measured to be between 21-32 Watts when idle compared to the 18-25 Watts of its predecessor. Even when loaded, the Y510P consumes more power. In the first stage of the 3DMark 06 benchmark, we measured close to 113 Watts for the Y510p despite the absence of Turbo Boost, compared to 104 watts on the Y500 with Turbo Boost. The SLI is always enabled as it does not implement the Optimus technology to switch down to the in-built GPU on the CPU for less demanding graphics applications. Under heavy gaming load, the Y500 remained less power hungry with just 105 Watts compared to the Y510p at 113 Watts. Consequently, battery life is a disappointment for this portable 15-inch laptop as most specimens in this size range are generally expected to last over three hours before the next charging. The IdeaPad Y500 had a more powerful battery which outlasted that of the Y510p by about an hour at the most. Gamers may opt for a more powerful after-market battery pack or have a spare one to offset this fast battery drain issue. Serious gamers generally have a spare fully charged battery when on the road. As in all GPU solutions using dual card configuration, micro-stuttering can be annoying when playing games that would not play smoothly in other laptops with slower graphics engines. Two GPUs in SLI configuration draw frames on the screen one after the other. This has the potential to cause delay between the frames at irregular times and make the stuttering visible. A few demanding games played on this laptop exhibit stuttering when they register below what we consider as the critical frame rate of 40fps (frames per second). In games like Metro: Last Light, and Far Cry 3, the SLI GPU-configuration ends up falling below this threshold when played at full high-definition using high to ultra-high gaming detail settings which are often preferred for playing PC video games. These titles appear to be more vulnerable to micro stuttering. 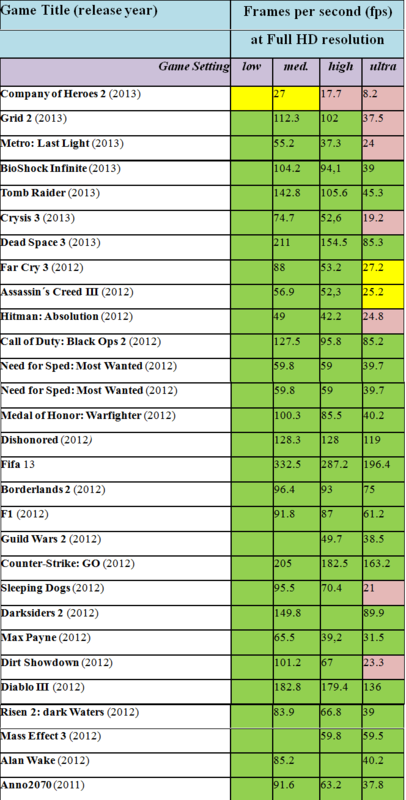 However, you can count such games with your hands as most popular PC games do not suffer the same micro-stuttering. A short battery life may not be an issue for gamers whose laptops remain tethered to the AC socket, and perhaps 2-hours on the road is enough gameplay for many which this IdeaPad Y510P can survive before dying out on you. But perhaps the more significant problem is that after half an hour of playing a resource-intensive game title, the unit gets extremely hot. After just 2 hours at low load levels or at idle, the laptops gets quite warm at 35 °C (95 °F) which is considered high. And when stressed by our FurMark and Prime95 benchmark test for one full hour, the top body reaches 48 °C (118.4 °F) and the bottom reaches 44 °C (111.2 °F). The implication is clear; you need an effective cooling system if you will be playing sophisticated games on the IdeaPad Y510p for more than an hour. Our test showed there is no throttling to the lower in-built GPU at predefined high temperatures as this feature has been disabled by Lenovo. That means you could risk damaging the laptop without a cooling system. There is no such thing as a perfect laptop, at least not one that fits everyone’s expectations. The IdeaPad Y510p has its share of features one can easily nitpick. Apart from its non-TurboBoost Implementation, its high-gloss plastic parts look good only when you don’t use it, not to mention cheap. Then there’s the relatively high temperature once you go beyond 30 minutes of playing some really demanding game, not to mention the rather short battery life that effectively puts the lie on the Haswell’s ability to better manage power consumption. The touchpad certainly can feel better but since serious gamers generally prefer to use an external mouse, this can be considered a non-issue as far as this review is concerned. Having said that, if you are not especially annoyed with slight micro-stuttering for a few demanding games due to the inherent disadvantage of using SLI configuration, and are not particularly fond of playing Company of Heroes, the IdeaPad Y510p can easily be considered the best value gaming laptop for its screen size and price point. Despite a glossy body, the full HD display is not. This, together with the screen’s exceptional ability to reach a brightness level not found in other laptops in this class, makes the IdeaPad Y510p highly viewable outdoors. A backlit keyboard can be quite useful when using the laptop in the dark. On the other hand, a relatively fuller-bodied sound from its diminutive laptop speakers may not matter much to serous gamers who prefer to use powered external speakers or a good headset; but they certainly add value to the laptop. Its winning features are without doubt, the Lenovo’s UltraBay and its graphics engine. The bays alone offer swappable drive abilities, allowing the user to quickly snap into place a secondary GPU, a Blu-ray optical drive or another hard drive/SSD without missing a beat of whatever application you are using, including games. It would be difficult to find another 15-inch laptop in the same weight class like this Lenovo IdeaPad Y510p that boasts the same flexibility and gaming muscle of a GeForce GTX 680M or GTX 770M graphics card in single or SLI configuration at the same MSRP of 1,000 Euros (around $1,300). . In fact, it would be a real technical wizardry to cram all that power and features at this size and price. The Lenovo IdeaPad does an outstanding job that defines what a high performing gaming laptop should be at this size and price point. At the 1000$ price point, thats probably the best choice. You can buy it here. What else can I say? Its absolutely the ultimate bang for your buck laptop.